Allan Sikk does not work for, consult, own shares in or receive funding from any company or organization that would benefit from this article, and has disclosed no relevant affiliations beyond their academic appointment. In March, a new government won power in Estonia. The change of government was triggered by the decision of the prime minister, Andrus Ansip of the ruling Reform Party (RE) to step down so that he could replace Siim Kallas (also RE) as a European commissioner who would, in turn, replace him as prime minister. In turn, Kallas started negotiations with the centrist Social Democrats (SDE) to replace nationalist-conservative Pro Patria and Res Publica Union (IRL) in the ruling coalition after tensions had developed between the parties. But Kallas was forced to withdraw following allegations connected with his term as the president of national bank in 1990s. Taavi Rõivas, a 34-year-old minister of social affairs, promptly finalised the negotiations and became Europe’s youngest prime minister. Estonia’s six MEPs are elected by proportional representation in a single nationwide constituency. The four parliamentary parties are currently supported by around 20-25% of voters. The Social Democrats have a marginal lead over Reform that is recovering from various scandals. The support for the mildly authoritarian centre-left Centre Party (KE) and IRL is slightly lower, but all four are likely to win a seat. The two remaining mandates are up for grabs as parties face some significant competition from independent candidates. In 2009, an independent candidate Indrek Tarand managed to win more than a quarter of votes. In his campaign, Tarand rallied against “partocracy” and singled out the introduction of closed party lists in European elections as its starkest manifestation (all other elections in Estonia since independence had employed open lists). His success has encouraged many independent candidates this year, several of whom are well-known. These include two politicians recently expelled from the Reform Party: Kristiina Ojuland, an incumbent MEP implicated by an electronic voting scandal and Silver Meikar, whose confessions triggered a major party funding scandal in 2012. While Tarand stands a good chance of re-election, a success by any other independent candidate or extra-parliamentary party would be a surprise. Curiously, the question whether successful candidates will take up their seats has possibly attracted more attention than European issues and party manifestos. Major Estonian parties have such an established tradition of fielding prominent candidates with no intention of actually taking up their seats as MEPs that a metaphor of “decoy ducks” has entered political parlance. Edgar Savisaar, the infamously dominant leader of the Centre Party, has openly declared that he will not step down as the mayor of Tallinn when elected. Even though most of Centre Party’s leaders are ethnic Estonians, it is highly popular among Estonia’s Russian-speakers – many of whom are not Estonian citizens and can only vote in local elections. That explains Centre Party’s popularity in Tallinn that is ethnically more mixed than the country on average. The party is also seen as Russian-facing because of its long-standing (though not active) co-operation agreement with Putin’s United Russia and Savisaar’s links to Russian business leaders. In 2010, Vladimir Yakunin, the president of Russian Railways, supported one of his pet projects (a new Russian orthodox church) prompting the Estonian Security Police to consider Savisaar an agent of influence for Russia. The most divisive of Estonian politicians by some margin, Savisaar’s recent comments on Ukraine have stirred further controversy. He has refrained from denouncing Russia and even talked about Ukraine’s “cudgel-wielders’ government”. Other leading members of his party have voiced support for Ukraine, but avoided open confrontation with Savisaar. His comments may affect the Centre Party’s performance as his democratic and patriotic credentials have been called into question. 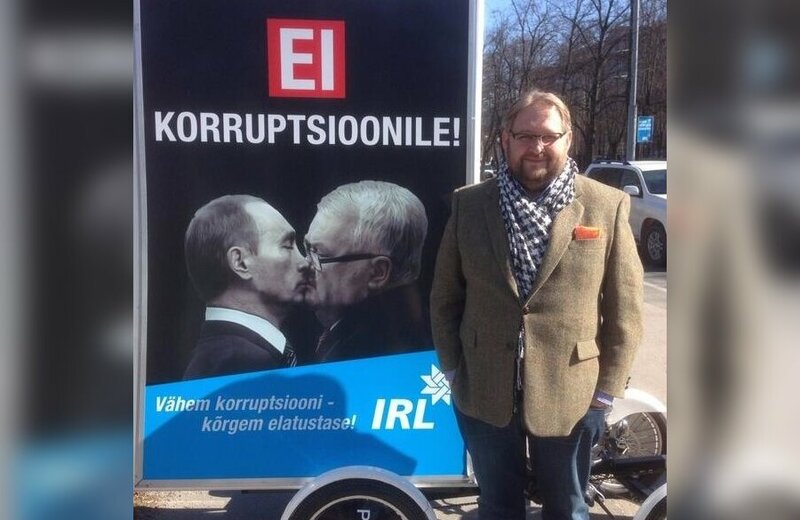 Recently, a campaign poster depicted Savisaar kissing Putin, modelled on the famous photo of Brezhnev kissing Honecker. Savisaar is the only leader of a major party in the running. Reform’s top candidate is Ansip who, before his recent resignation was the longest-serving prime minister in the EU. He is likely to become an MEP, but is thought likely to take up a post with the European Commission at some stage. The party’s other candidates include the daughter of Siim Kallas and three cabinet ministers. The Social Democrats’ list is led by Marju Lauristin, party leader in early 1990s and a prominent sociology professor who has been away from front-line national politics for more than a decade. She is likely to join the European Parliament, but three of the party’s candidates have just become ministers in the national parliament and are less likely to take up seats. IRL has proudly declared that there are no “decoy ducks” amongst their candidates. Their top candidates are Tunne Kelam, former party leader and MEP since 2004, and Ene Ergma, a veteran former speaker of the parliament. Hence, main party lists are dominated by political dinosaurs: Savisaar, Lauristin and Kelam were all key leaders of independence movements in the 1980s. Together with Ansip, they are likely to share most of the preference votes between them.